Europa, the icy satellite of Jupiter, is covered in a thick crust of scarred and cross-hatched ice. 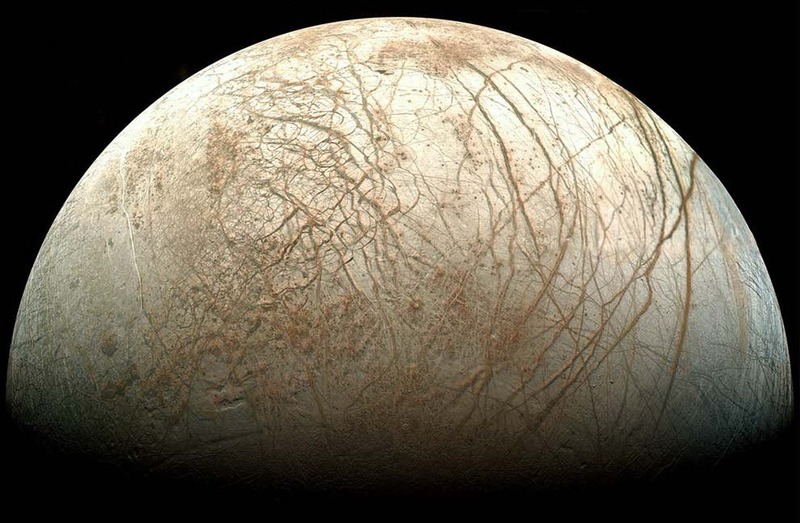 Missions to Europa, which is comparable in size to Earth’s own moon, by NASA‘s Galileo spacecraft have brought back measurements which indicate the crust is tens of kilometers thick, however under it lies a warm ocean as far as 62 miles in depth (the deepest point of an ocean an Earth is 6.2 miles in the Pacific’s Mariana Trench). Scientists speculate that these oceans not only may support life, but foster! Today, November 16th, NASA will host a Science Update at 10 a.m. PST (1 p.m. EST), in which new theories will be discussed publicly concerning Jupiter’s moon and supposed life. The event can been streamed live at NASA TV, or on Ustream with a moderated chat. Europa is thought to have a hot, iron core and an ocean underneath its thick crust of ice on the surface. Measurements indicate that the ocean is in liquid form and is actually warm, heated by the tidal stresses exerted on Europa by Jupiter and several other large moons, as well as by radioactivity. The required substances and elements to harbor life are mixed and flowed through the ocean by the same powerful currents. Jupiter’s Europa might not only sustain, but foster life, according to the research of University of Arizona’s Richard Greenberg, a professor of planetary sciences and member of the Imaging Team for NASA’s Galileo Jupiter-orbiter spacecraft.